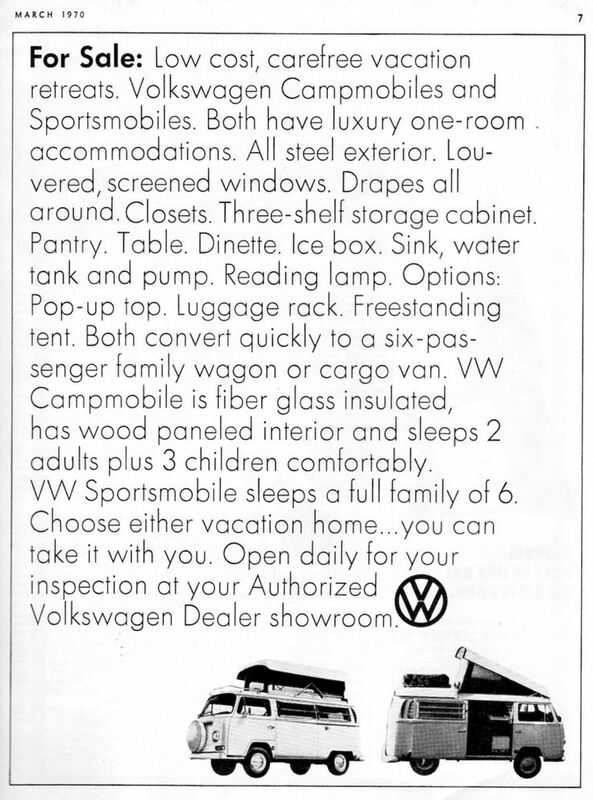 There’s a small VW hotel. 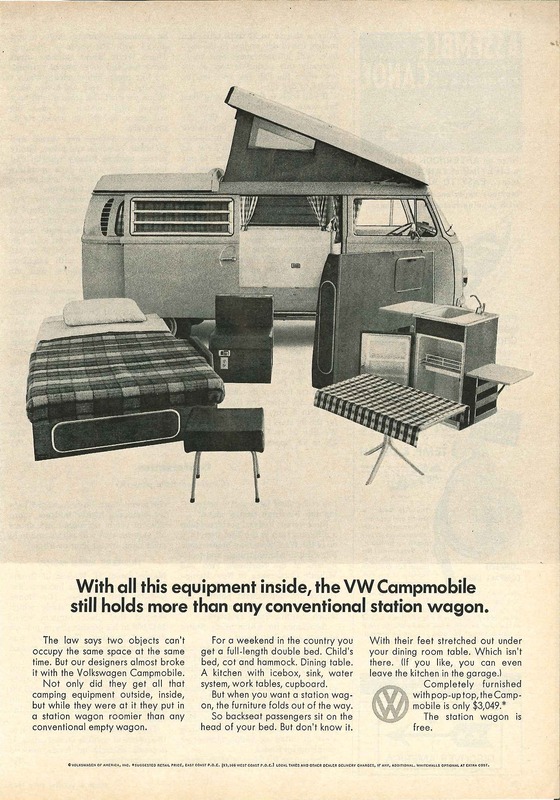 With all this equipment inside, the VW Campmobile still holds more than any conventional station wagons. The law says two object can’t occupy the same space at the same time. 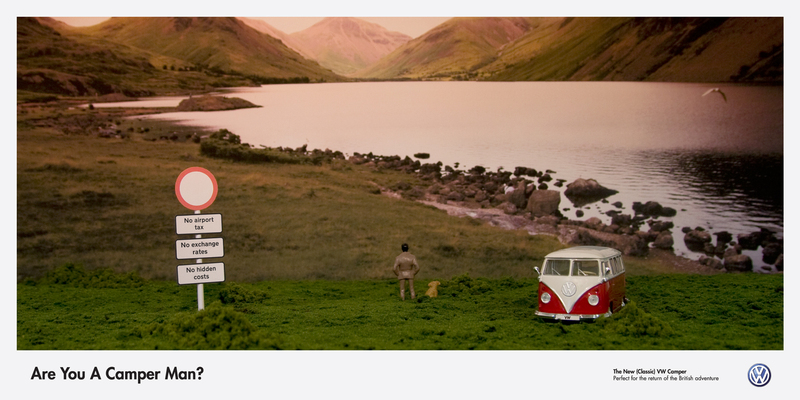 But our designers almost broke it with the Volkswagen Campmobile. 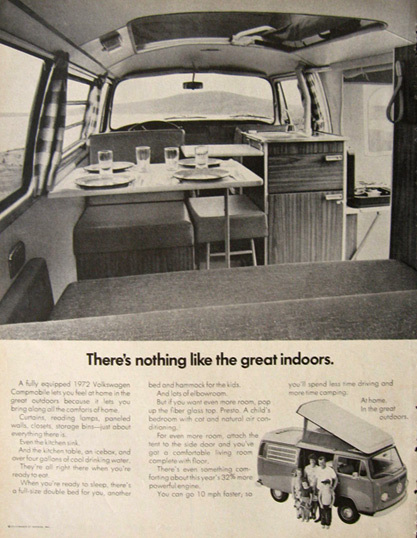 Not only did they get all that camping equipment outside, inside, but while they were at it they put in a station wagon roomier than any conventional empty wagon. For a weekend in the country you got a full-length of double bed. Child’s bed, cot & hammock. Dining table. A kitchen with ice box, sink, water system, work tables, cupboard. But when you want a station wagon, the furniture folds out of the way. So backseat passengers sit on the head of your bed. But don’t know it. With their feet stretched out under your dining room table. Which isn’t there. (If you like, you can leave the kitchen in the garage). 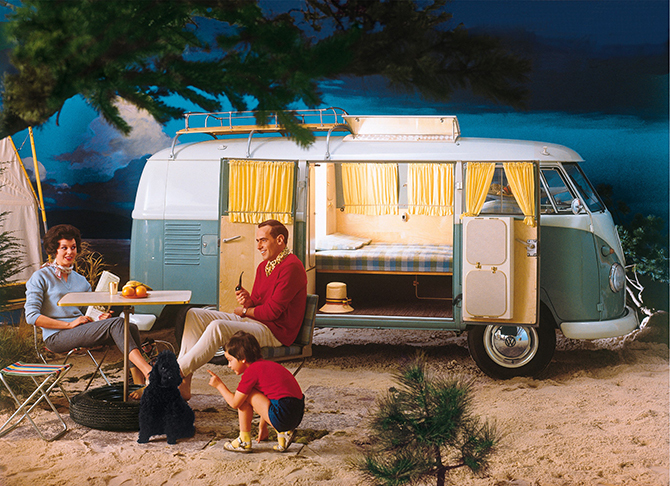 Completely furnished with a pop-up top, the Campmobile is only $3,049. The station wagon is free. 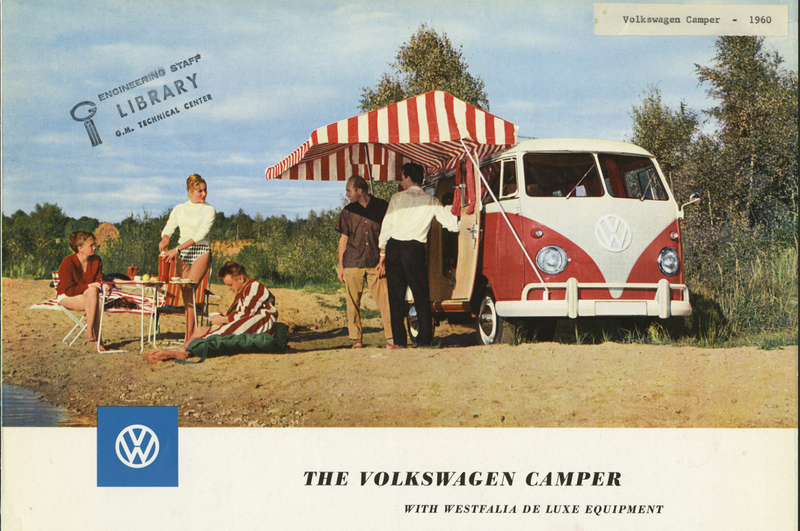 A classic VW campervan illustration for advertisement. Date unknown. There’s nothing like the great indoors. 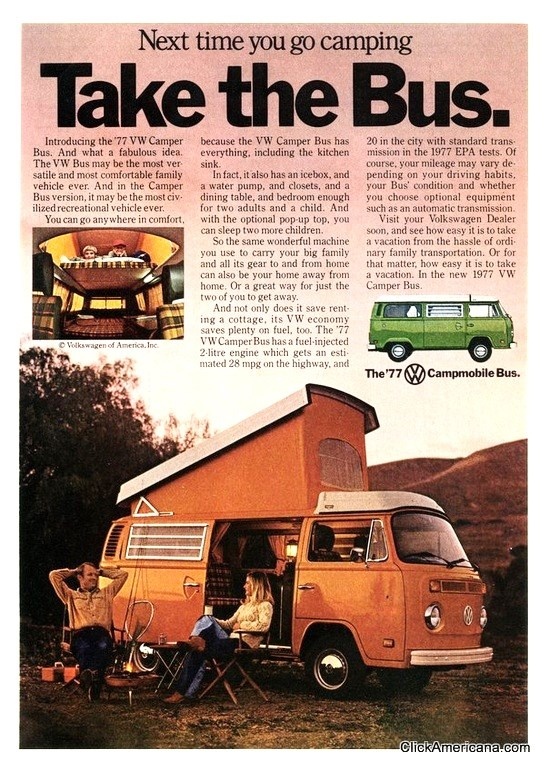 A fully equipped 1972 Volkswagen campmobile lets you feel at home in the great outdoors because it lets you bring along all the comforts at home. Curtains, reading lamps, paneled walls, closets, storage bins – just about everything there is. And the kitchen table, an icebox, and over four gallons of cool drinking water. They’re all right there when you’re ready to eat. When you’re ready to sleep, there’s a full size double bed for you, another bed & hammock for the kids. But if you want even more room, pop up the fibre glass top. Presto. A child’s bedroom with cot and natural air conditioning. For even more room, attach the tent to the side door and you’ve got a comfortable living room completewith floor. There’s even something comforting about this year’s 32% more powerful engine. You can go 10mph faster, so you’ll spend time less time driving and more time camping. At home, in the great outdoors. 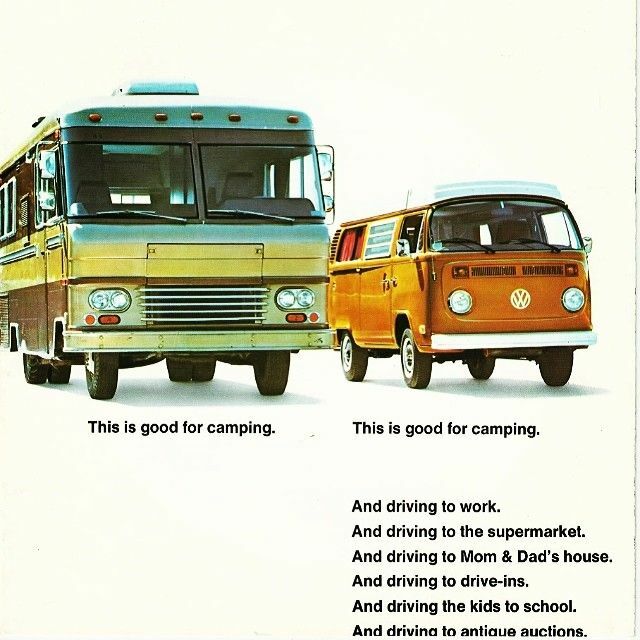 The advertisement from Devon, one of camper manufacturers at that time. 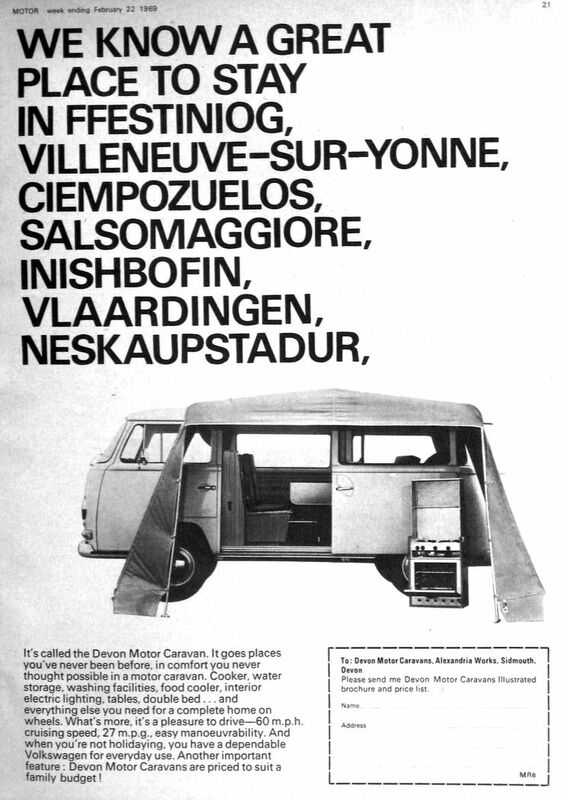 Another classic illustrative campervan advertisement. 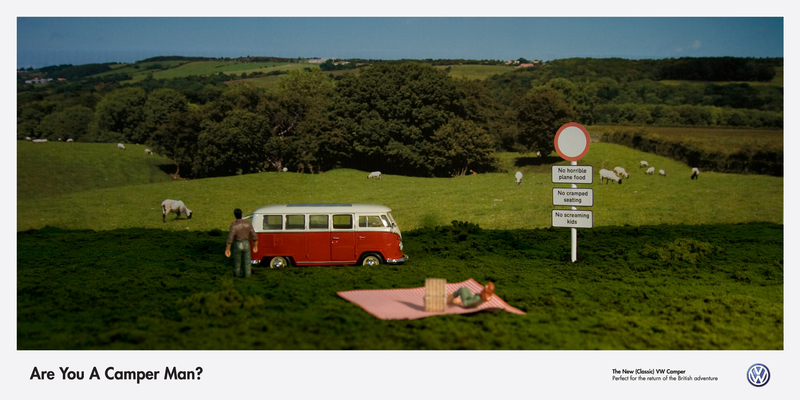 Next time you go camping, take the bus. 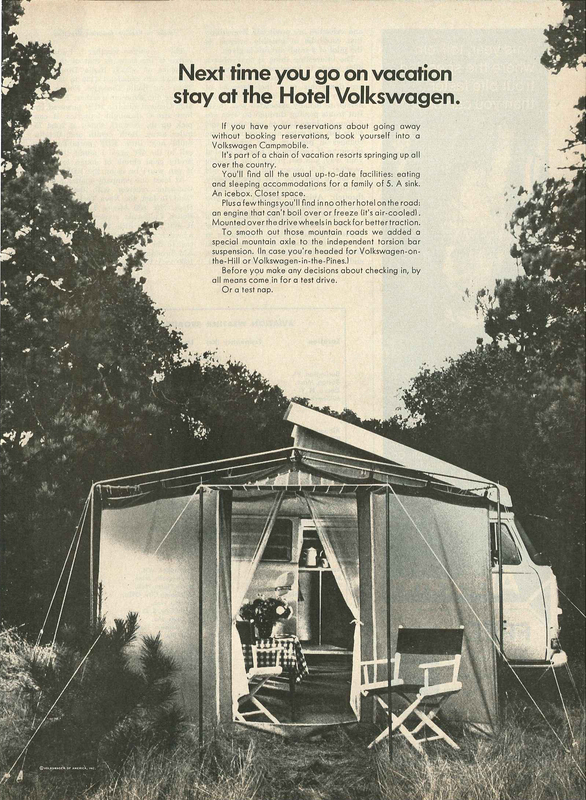 A 1960 advertisement from Westfalia. 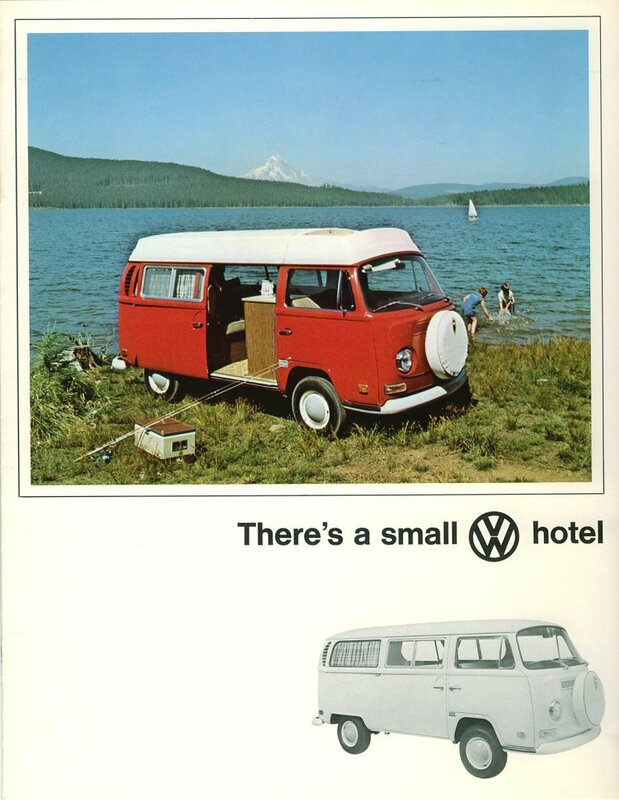 Next time you go on vacation stay at the Hotel Volkswagen. 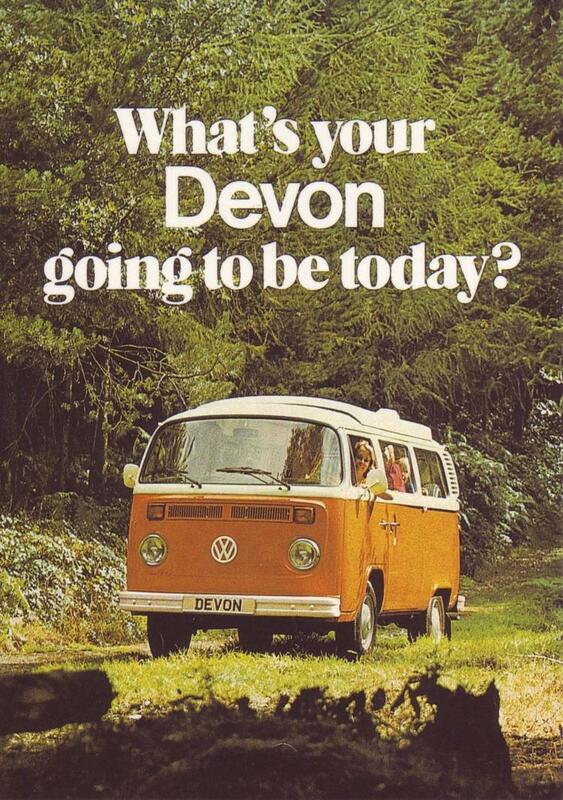 A classic Devon advertisement, 1969. 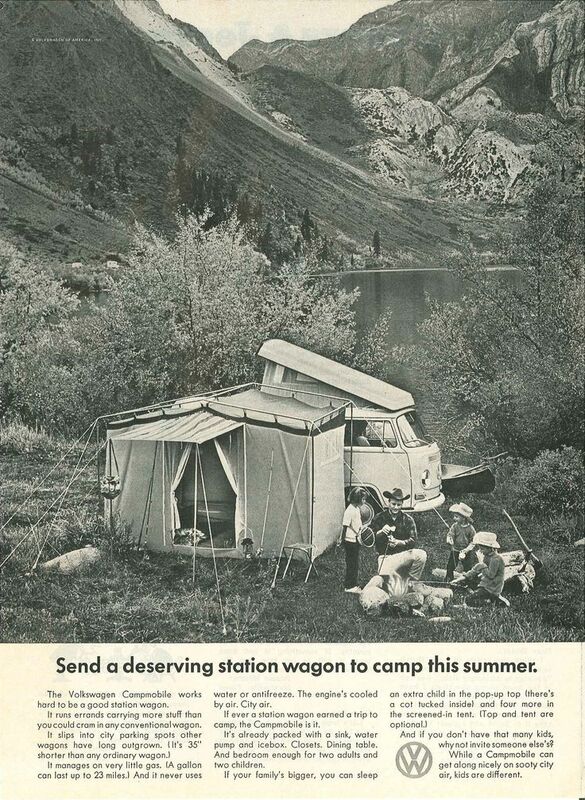 Send a deserving station wagon to camp this summer. 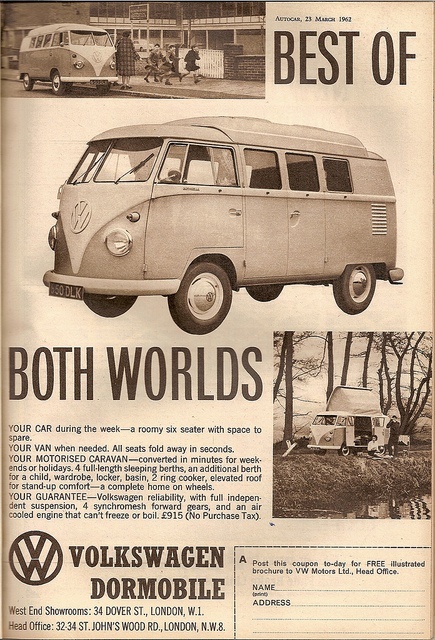 A VW Dormobile British advertisement. 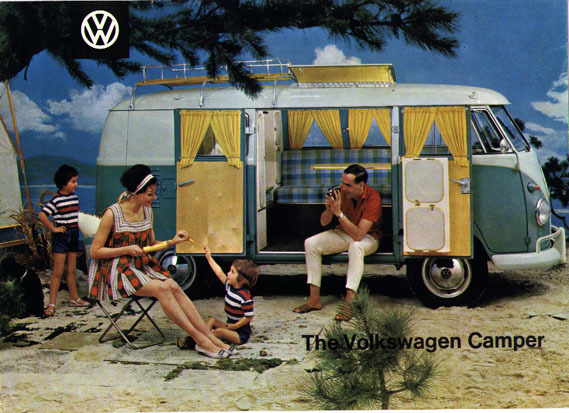 Another vintage British advertisement selling VW Campervans. 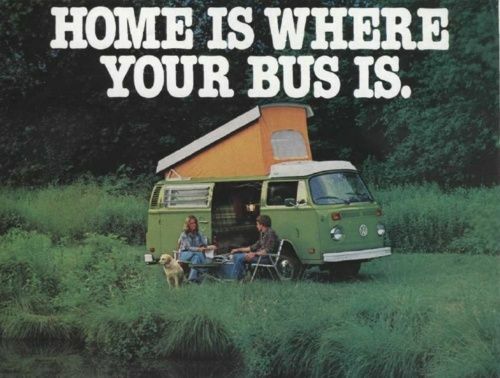 This photo makes some people want to sell everything they own, travel the world, and live out of a car. Life would be so simple! 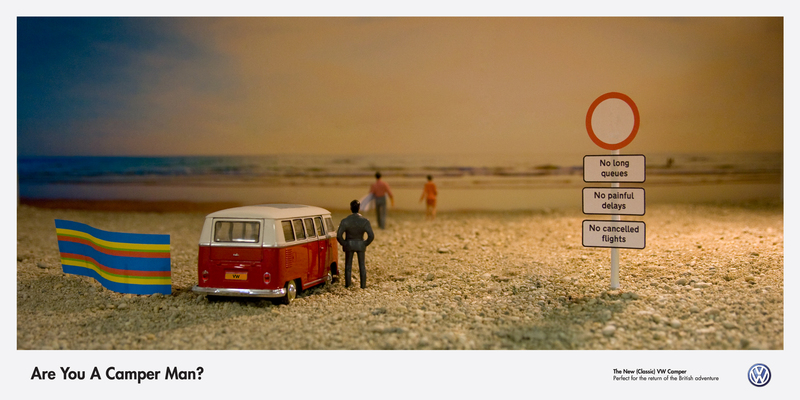 Your ideas are really helpful and you always inspire me with your great ideas and techniques… I’m also living in my campervan and almost visit minimum 5 times on your site in a month… to be updated with your thoughts… Thanks again for this post….